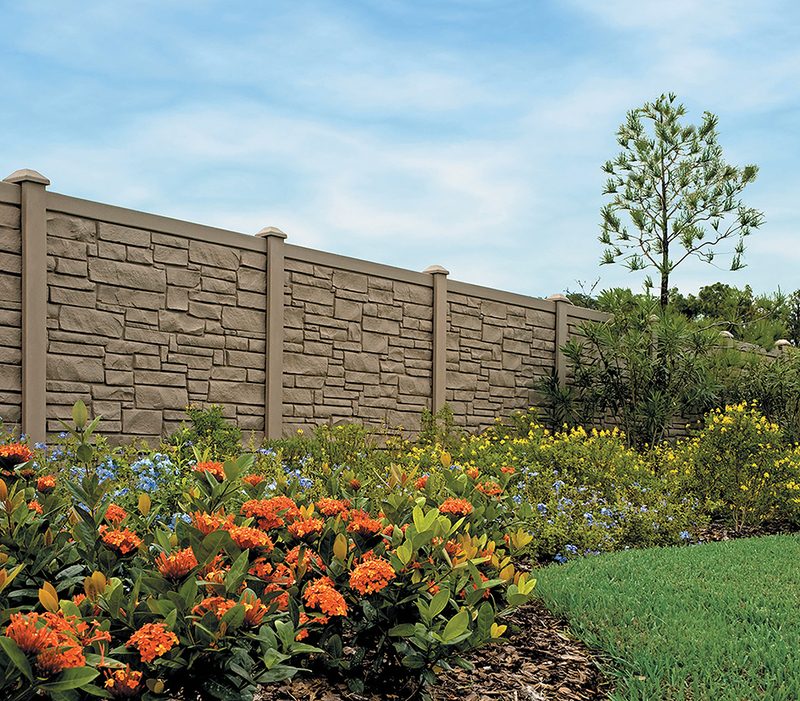 Simtek’s Ecostone product (shown in Brown Granite) has polyethylene panels up to 6 feet tall; its 4-foot height can be stacked to create an 8-foot-tall fence. In every issue of Design NJ, The Carefree House asks an expert about durable products of interest to homeowners. This issue focuses on fencing. Design NJ: Why opt for a plastic fence rather than natural stone or wood? DOUG MUCHER: Curb appeal and performance are important considerations in choosing the right exterior products for a home. Vinyl and polyethylene fences can transform an ordinary outdoor area into an extraordinary exterior living space that adds value and shows off a homeowner’s personal style. With man-made materials, you are buying a product engineered for outstanding strength, low maintenance and long-lasting beauty, thanks to innovative colors, styles and textures. Synthetic fence has all of the good things about wood without the headaches—and is less expensive than wood and stone in the long run. Although it may cost more initially, that is where the expense ends. For instance, CertainTeed’s Bufftech® [polyvinyl chloride] and SimTek® [molded polyethylene] fence products never need painting or staining; will never chip, peel, crack or splinter; and won’t rot or support mold growth. When you’re shopping for fencing, you also want to ask about fading. CertainTeed’s Bufftech offers ColorLast™ fade protection for superior color retention, a state-of-the-art acrylic formulation that provides superior protection from the harsh sun. And our company’s SimTek Panels are fade-resistant and contain ultraviolet inhibitors for a lifetime of vibrant colors. Maintenance is the biggest reason to choose vinyl, because all you need to do is occasionally, maybe once a year, wash off any dirt and dust with a garden hose. Price also comes into play for genuine stone because hiring a contractor to construct a stone wall can get very expensive. DNJ: Are there other advantages to man-made products? MUCHER: If your property is near a noisy neighbor, you’d be interested in fencing that provides a dramatic sound barrier for a much quieter yard. Look for options that do that. Also PVC doesn’t readily ignite and is categorized as being self-extinguishing. Horizontal fencing is compatible with homes of diverse architectural styles. 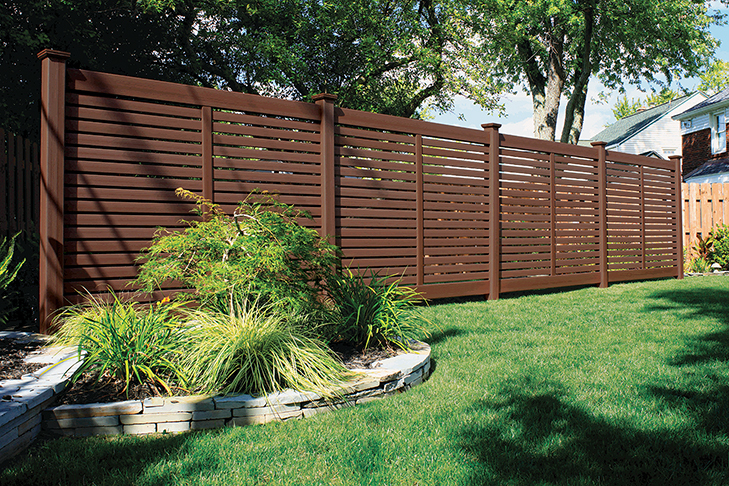 Shown is Bufftech’s Breezewood fence in the color Brazilian Blend. DNJ: With stone-look panels, are consumers limited by sizes? MUCHER: Our Ecostone panels come 3 feet high by 6 feet wide, 4 feet high by 8 feet wide, and 6 by 6. Two 4-by-8 panels can be stacked to make an 8-by-8 section. Widths can be cut onsite as needed. Bufftech panels are available in 3-, 4- , 5-, 6-, 7- and up to 8-foot heights depending upon product line. DNJ: Many plastic fences are flat and plain, and they’re nearly always white. Are other options available? MUCHER: The surface can be textured, and the fences come in various colors depending on the texture chosen, including wood and stucco looks. Man-made fence options offer coordinating accents such as lattice, caps and gates in various styles. Some even have solar cap light options for improved visibility and ambience at night. DNJ: What about the posts? Are they more durable than wood? MUCHER: Man-made posts do offer advantages. SimTek posts, for instance, are manufactured using polyethylene material and are also steel-reinforced. Bufftech’s are vinyl, PVC, with aluminum inserts offered for gate posts. Neither requires sleeving over wood posts. And the posts have been engineered for impact-resistance and to meet strict code requirements. DNJ: What prevents gate hardware from failing (even along the Jersey shore)? MUCHER: Look for materials that don’t corrode and rust—for example, engineered gate hardware in stainless steel or nylon gate hardware kits. Versatile and virtually maintenance-free, kits include key-lockable latches, self-closing hinges and contoured gate handles. 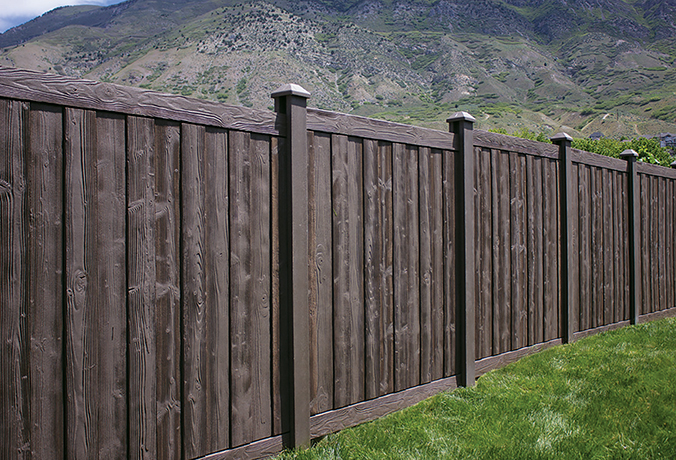 Ashland fence, a subset of CertainTeed’s Simtek line, closely mimics the look of wood. Pictured is the Walnut Brown option. DNJ: How do I choose a fence style that will be pleasing for decades? MUCHER: Many fence styles, traditional to contemporary, are available to complement all types of architecture. You’ll see fencing for privacy to traditional pickets and everything in between in various heights, styles and textures. For example, horizontal fence styles are hot right now for a more contemporary house but also work with Craftsman or more traditional-looking homes. We offer Fence-it™, an online fence visualizer tool at Fence-it.CertainTeed.com. Using it, you can try out different looks. 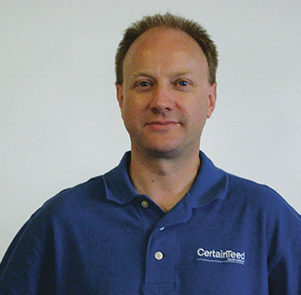 You can work with the Fence-it tool and your fence contractor [certified contractors are listed on CertainTeed.com], who will also have insight into what works best for your particular landscape, neighborhood and property needs. Fence-it will not work with specific home photos, however. MUCHER: Yes. Look for a warranty that stays in effect many years—25 or more—and bear in mind that real wood and stone do not have warranties. A transferable warranty could be a bonus for you if you sell your property. Ours is transferable one time. Freelance writer Mary Vinnedge developed a case of fence envy while researching this article. Alas, her cedar fence is in need of replacement pickets after only three years.